What are those lovely pools of light spilling from the 50PF9631D's sides? That'll be Ambilight: fluorescent tubes down the TV's sides that project coloured light - sympathetic to the content of the picture you're watching - onto the nearest wall. That's a first-rate start for the 50PF9631D, which is helped along by the set's lovely high-gloss black screen frame and recessed speaker section. Connections are impressive too: two HDMIs, component video connections, and a USB port for reading digital media files are among the highlights. Backing up the big guns are the rear guard of Scarts, S-video and the usual digital audio ins and outs. The digital audio jacks point to the presence of a digital TV tuner. There's also a common interface slot for the CAMs needed to access the Top Up TV pay-TV package. The digital tuner has a seven-day electronic programme guide (EPG). And reminders can be set for upcoming shows, making missing your favourite programmes a thing of the past. High among the set's key features is the presence of Philips' Pixel Plus processing, which gets to grips with most aspects of the picture, in particular fine detailing. This version of the processing is Pixel Plus 2, which isn't the very latest version optimised for hi-def sources. 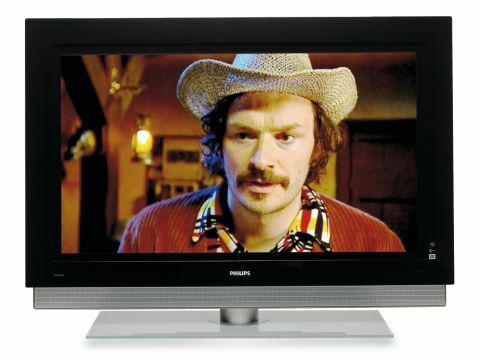 We'd like to doff our caps to the excellent remote control, MPEG noise reduction facilities, Active Control and digital natural motion, all of which add to the enjoyment of using this plasma TV. After all that, it's a bit of a shame to discover that the sleek looks and weighty features and great connectivity are slightly shadowed by the pictures themselves. There's no denying that this Philips is capable of a robust picture performance, but there are a couple of things we take the TV to task over. There's a bit too much picture noise for our liking, but there's general dot crawl and fizzing issues apparent with both hi-def and standard-def footage. Although Pixel Plus 2 can be beneficial for hi-def feeds, let loose on our standard-def test DVD of The Devil Wears Prada, the pictures were over-cooked: far sharper and intense than they should have been. Colours are generally natural, but greens in particular seem to dominate the proceedings, making foliage in a hi-def feed of Planet Earth overpower the surrounding land and fauna. Elsewhere, though, the Philips puts in a cracking picture performance. Colours are vibrant (just mind your greens) and low-lit skin tones particularly impress. Black levels are first rate, with some good shadow detailing. Motion looks sharp and smooth and despite the slightly harsh rendering of some images, standard-def pictures are more accomplished than we had expected. In the sonic department, the speakers may look unassuming, but the results are anything but. Soundtracks jump into life with plenty of subtle touches and dialogue is always crisp and clear. Overall, this is a great TV that's well worth an audition. There are a few picture issues, but none that are real deal-breakers, especially considering the competitive price. But however close the 50PF9631D comes, it doesn't get a cigar.